My 9-year-old (almost 10) daughter, Kasidy has a theory on L O S T. And, quite frankly, she blows my mind. Her theory is a Trinitarian island theology. If you are a fan, please read on. If not, this will make no sense and you may be bored. Now, after she came up with her theory, I checked around on line to see if anyone else had blogged about similar things. I found a couple but, her insights are even better than what I found. The Island is the Father. 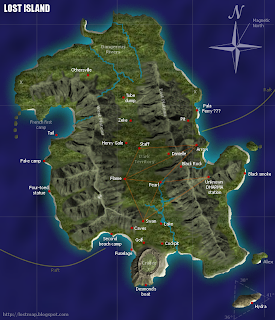 The island is also known as “Jacob.” The island has a will. A plan. The island is living. The island is eternal. The Son is the physical representation of the island. Richard Alpert is the Son. Richard doesn’t age, he understands the island, and he is part of the island. Richard could also be a “John the Baptist” figure talking about and searching for the one who is to come. This could also mean that John Locke is a possible Jesus figure. John rose from the dead or, in fact, the island (Father) raised him from the dead. He also seems to exhibit some healing powers. It is possible others have been healed simply by being around John Locke. The smoke monster. Mysterious. Truth teller. Judge/One who convicts. This theory plays out in so many ways. No one has “seen” Jacob (at least not yet). Jacob may only be known through those who do his will. The Others (disciples of John?) have been looking for “the one” to come and had hopes that John Locke was “the one.” Their test for John Locke was to see if he would kill his father. He refused. So, they abandoned their hope of him being their “messiah.” The “one” the Others have been looking for seems to be someone who will finally settle their battle with those who don’t belong on the island. Isn’t this much like the biblical account? The Jews believed their Messiah would come to be a conqueror who wielded a sword and set things right with their enemies. The real Messiah came to “conquer” through peace. The smoke monster convicts Ben of his sin and makes him face his demons. It is also a protector—though it is a bit scary. Ben is a bit of an anti-Christ figure. He is likeable to an extent yet highly manipulative, a poseur, and thinks too highly of himself. He wants to be “the One” but knows he isn’t. Still, he presses forward consumed by his addiction to power. And, John Locke . . . who is his father? We know who his mom is. We thought we knew his dad but, it wasn’t “really” his dad. There’s really no father in the picture. Unless . . . there was some sort of immaculate conception for him who always seems to know his job is to do the will of the island, even when it doesn’t make sense to everyone. Father knows best. As we teased this out a bit more, the possibilities are endless for this theory. In what other ways can you see a Trinitarian model in L O S T?